All workshops are open to the public, except where noted. 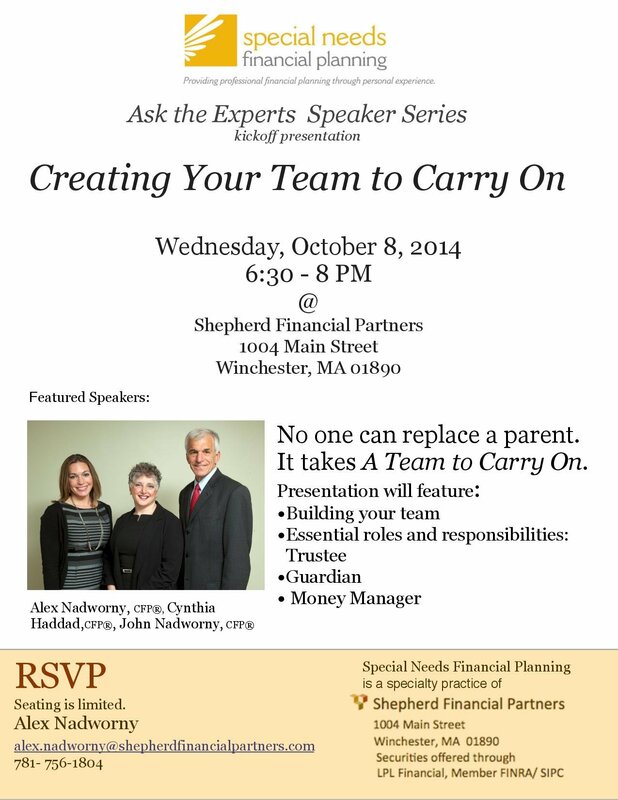 For more information- please contact Alex Nadworny, 781-756-1804 or by email at alex.nadworny@shepherdfinancialpartners.com. Click on the image above and email Alex to reserve your space today. To access a printable PDF version, click here. To contact Alex for more informaiton or to schedule a presentation for your group, click here . Click on the image below to view the full-size, printable version. 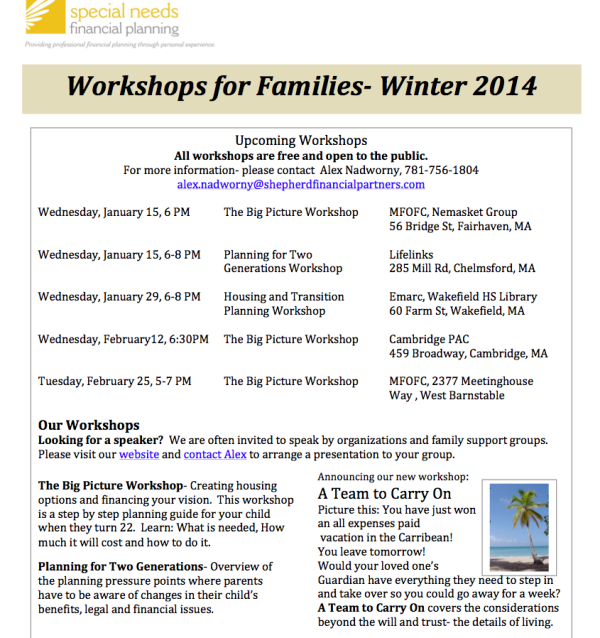 Massachusetts Families Organizing for Change is pleased to announce our 2014 Family Leadership Series. The Series focuses on supporting families and individuals to live in their communities as naturally and typically as desired. Applications from families with children or adult family members of any age who are Department of Developmental Services eligible are encouraged to apply. The Family Leadership Series has a three-fold purpose. 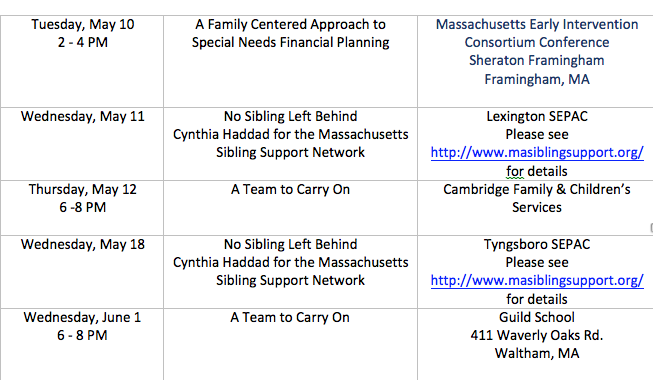 The first is to offer information about family leadership and the history of family involvement in the disability arena. The second is to assist families in creating a vision for their family member. The third is to connect them with information on how families can become a critical voice that influences local and state policy and funding streams for all persons with disabilities. 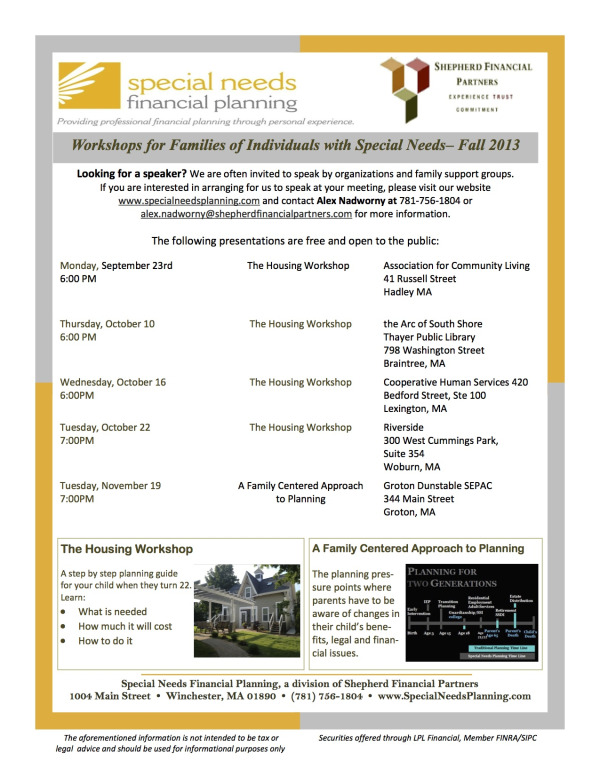 The Family Leadership Series is comprised of three Fri/Sat (2) day workshops and one final day wrap-up Saturday session. Initiative and Leadership - Participants are given information on the background of the family support movement, leadership, advocacy and the significance of self-advocacy, how to effectively advocate towards creating change and ways to influence funding and delivery systems. Creating A Vision - Participants learn how to create a vision for your loved one and innovative ways to think about community living and family support, best practices and meaningful options. Families are supported to "imagine better" and to create a vision, with and for their family members, that becomes a guide for their leadership and advocacy. Policy Making at the Local, State and Federal Level - family members receive information on how to develop networks with legislators and families, on how to access and control resources that affect family stress and satisfaction and how to use legislative change to procure resources. Taking Care of ourselves – Relax, laugh, and experience the value of taking care of you. Then a Family Leadership Graduation Celebration!!!!!!!!!! To attend all four sessions including three Fri/Sat two-day sessions (staying overnight at the hotel) and the final one-day wrap-up Sat session. To participate in activities/experiences during the sessions and to complete assignments/reading between each session. Commit to reach out to their legislators about their need for family support and tell their personal story to their elected officials. We expect that, upon completion of the Series, families will continue to advocate for and work to create change for their families/loved ones and will be willing to help other families in their areas to do the same. We also expect that you will join with MFOFC statewide network, as we all advocate for policies, practices and funding that maximizes our loved ones support and to live meaningful and enviable lives in our/their own community. 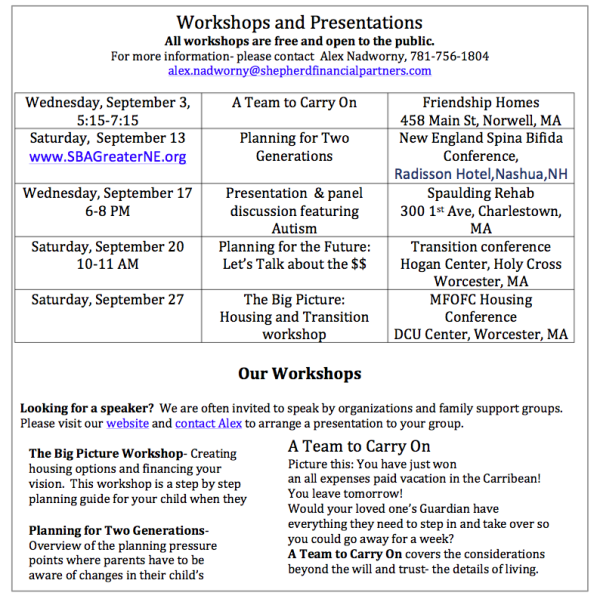 Events are held throughout the year within Metro Boston & Northeast areas and across the state to support your active voice for your loved ones and family. Click here for more information about the MFOFC. Click on the box below to view the full size, printable version.